Through the generous donation of a family bequest, we have purchased two trio bikes. 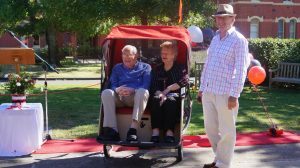 These bikes are designed so we can take residents out on rides around the beautiful lake Wendouree and surrounds. 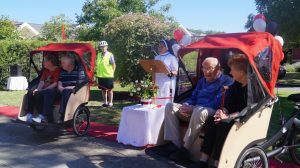 The aim of the program is to improve the lives of our residents, to make Nazareth Care Ballarat a place of joy and continued mobility. We believe life should be beautiful whatever age you are. 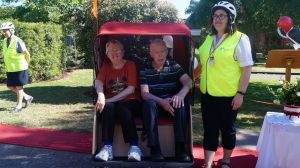 The program we are running is called “Cycling Without Age”. This “movement” was founded by a gentleman called Ole Kassow from Copenhagen in 2012. 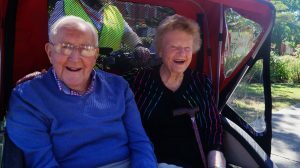 Ole decided to rent a rickshaw and offered rides to the residents living in the nursing home next door, this was a huge success. Pretty soon, Cycling Without Age was established and spreading to other cities in Demark and across Norway. Generosity permeates every single activity in Cycling Without Age and works its magic at many different levels. Slowness allows you to sense the environment, be present in the moment and it allows people you meet along the way to be curious about Cycling Without Age. 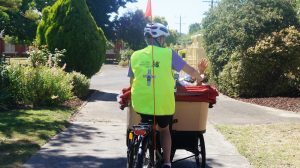 We tell stories, we listen to stories of the elderly people on the bike and we also document these stories when we share them via word of mouth or on social media. We create a multitude of new relationships across any border in our society. We let people age in a positive context – fully aware of the opportunities that lie ahead when interacting with their local community. 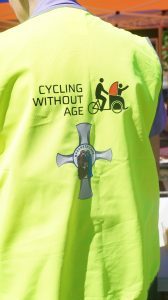 Today Cycling Without Age is represented in 37 counties worldwide and has 450 chapters and 1500 trishaws. 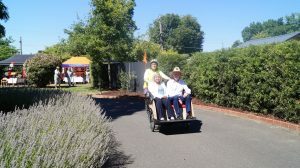 50,000 elderly people have been on rides. We are currently training our Pilots (volunteers) and look forward to embarking on this exciting and rewarding program for our residents.